Brighten your living space by growing plants in small pots. Apart from enhancing the aesthetic value of their surroundings, small pot plants also increase the oxygen circulation in enclosed spaces. The variety of plant you grow in small pots will depend on various factors like the light, temperature, humidity and water requirements of the plant. The peace lily, an evergreen plant, sports glossy foliage and beautiful flowers. It produces a tuft of leaves that are dark, shiny and oval shaped. The flowers are large fleshy white or greenish white. They can be grown in cooler climates. Due to its shade tolerance, low maintenance and availability of small size variety, peace lily is well suited as a small pot plant. The soil in the pot can be of any type, but it has to moist and well drained. If the soil is dry, the leaves may wilt. Keep the humidity high to get a good quantity of flowers. Also known as snake plant, mother-in-law’s tongue can withstand dry and tough conditions. The leaves of this plant are long and sturdy and are colored in different shades of green with yellow edges. The plant grows to a maximum height of 3 feet and needs little maintenance, making it ideal as a small pot plant. Moderate to warm temperatures and low humidity yields good results. Soggy soil can make the plant rot. It can be propagated by root division. Umbrella plant is a tender perennial that grows up to 5 feet in favorable conditions. Being a medium foliage plant, the plant can be grown easily in small pots. Long tender leaves cumulatively give a shape like umbrella to the plant. The plant adorns green or brown flowers. These semi-aquatic plants require frequent watering. They also require high humidity. In dry rooms, it can be attacked by spider mites. The tips of the leaves need to be pruned to make umbrella plant look bushy. Mostly found in tropical regions, the beauty of orchid flowers, and their exotic, odd shapes, make orchids desirable houseplants. According to MyOrchidCare.com, orchids grow best in small pots. Lack of good sunlight can result in wilting. Good ventilation and high humidity will help the growth of the plant and its flowering. Propagation is done by division. 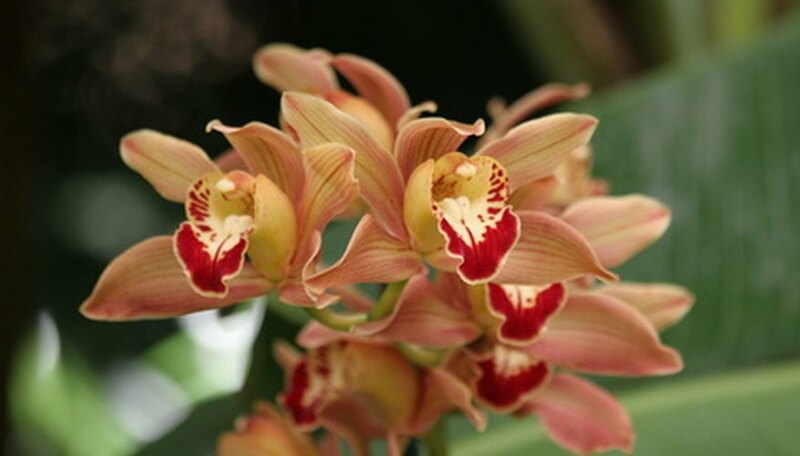 Different types of orchids are paphiopedilum, selenipedium, cypripedium, vandas, vanilla and ascocenda. An evergreen succulent, jade plant is another plant that comes in assortment of different sizes and colors. The leaves are shiny and succulent with colors that differ according to the variety. Jade plants need constant pruning. The plant reaches a height of 3 feet. Jade plants should get four to five hours of sunlight for best results. In summer, water freely--but in winter, watering should be conservative. Propagation is done by planting the leaves directly in pots. Different varieties are airplane plant, silver dollar plant, money plant and Chinese rubber plant. Based in Northern California, Devin Dupre-Neary has a bachelor's degree in nursing from UC Davis. Rather than move towards a master's or work in a hospital, he chose a different route. In 2009, he wrote professionally, part-time, writing articles on a host of subjects from health issues to gardening.